Today I will show masks that have been identified as the work of Conrado Rodríguez Cupis. The first was attributed to Conrado by his family at the time of sale to Barney and Mahina Burns in 2005 (B/M 424/416). Isn’t this a dramatic mask! The eyes look like those of Preciliano but the teeth support the family’s assignment to Conrado and the triangles under the eyes don’t curve like those of Preciliano. There is an area of damage on the left cheek. This series of posts about Yoeme (Yaqui) Pascola masks began on July 4, 2016. In this third post about the masks made by two brothers, Preciliano Rodríguez Cupis and Conrado Rodríguez Cupis, and largely drawing on the Burns collection, I will focus on masks that appear to have been made by Preciliano; some turned out to be by Conrado. I begin with a mask that Rodriguez family members attributed to Preciliano. It was collected by Barney and Mahina Drees Burns in 1996 (B/M 451/442). Looking at the full frontal view, I notice the design of the eyes (thin vision slits under painted eyes), which is typical of Conrado or Preciliano. This post will focus on masks that I would attribute to Preciliano Rodríguez Cupis, on the basis of the nose design. Although some were originally said to have been carved by other artists, you will have the opportunity to see how similar they are, as if all were by the same person. 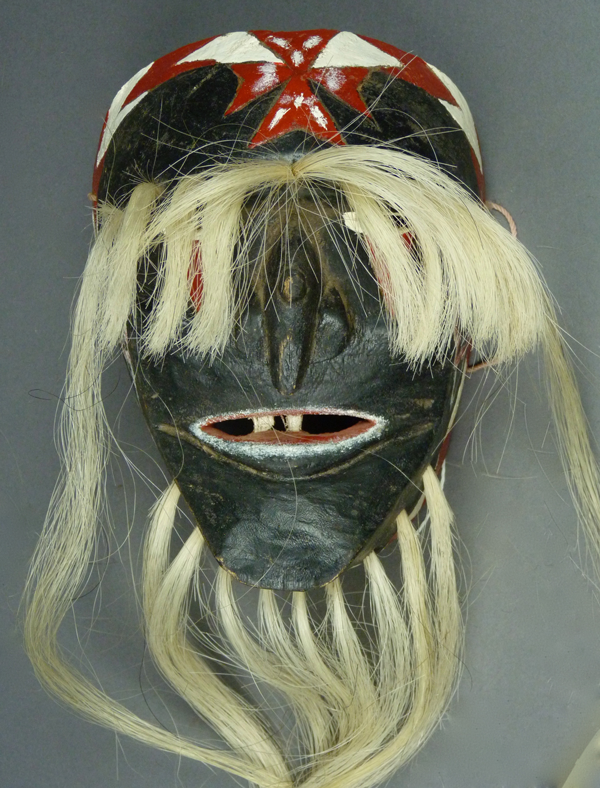 I will include one mask that was allegedly made by Conrado Rodríguez Cupis, which also has a dramatic nose. The first (B/M 206/203) was said to have been carved by Ruben Hernández, however neither Tom Kolaz nor I accept that attribution, as we each have a number of masks by that artist and this one is distinctly different from his hand. Furthermore, this is an obvious mask from the Rodríguez family, and a classic mask by Preciliano. The big tip-off is the nose, which is much like the one at the end of last week’s post. The forehead cross is also similar to the one on that mask. I see this as a brilliant mask. The warty nose is so dramatic. The prominent and rather abstract cheekbones also mark this mask as Preciliano’s. The integration of the cross with the rim design is probably a marker for Preciliano, and almost certainly a Rodríguez trait. Today I will introduce you to two more Yoeme (Yaqui) carvers from the Rodríguez family, Preciliano Rodríguez Cupis and his brother, Conrado Rodríguez Cupis. Preciliano was the father of Rodrigo Rodríguez Muñoz and Jesús Rodríguez Muñoz, while Conrado is their uncle. There are various spellings for Preciliano, and this is the version used by this family. When we encounter the Pascola masks of these four artists, certain similarities are obvious, and it is not always easy to decide whether a particular mask was made by one or another of them. Undoubtedly they learned from one another, and it is possible that they sometimes collaborated on a batch of masks. Rodrigo’s masks tend to be the most consistent in style, and those of Jesús frequently display a certain overall shape, but the masks of Preciliano and Conrado demonstrate greater variability. Either they are less formulaic or their styles have evolved over time. They are often wonderful, from an artistic perspective. 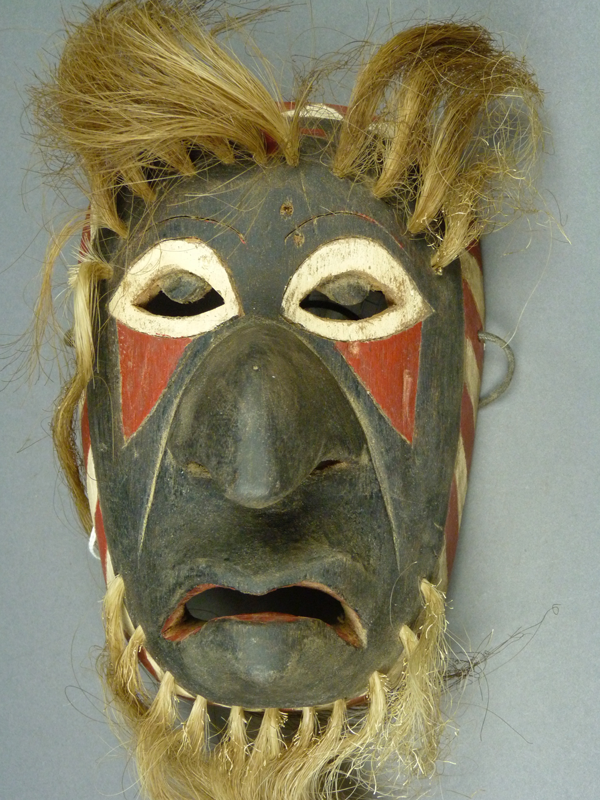 I will continue to draw mainly upon masks from the Barney and Mahina Burns collection to illustrate these carvers. I will begin with several masks that have been attributed to Conrado, whether by his family, Tom Kolaz, or me. The first (B/M 466) was sold to Barney and Mahina as a mask carved by Pedro Onamea in 1997, but Tom immediately recognized it as the work of Conrado. It is a spectacular mask. Unfortunately I neglected to take a side view that would have celebrated this nose. In addition to the obvious Rodríguez family features, this mask has some notable details; the eyes, although framed in the usual Rodríguez fashion, have carved irises. There is a dramatic oversized nose, a beaked mouth, and inscribed lines on the face, such as over the eyes. Beaked mouths on Pascola masks were in fashion 100 years ago, but here we observe that Conrado was participating in what would seem to be a living tradition. I had not planned on doing yet another post about the masks of Jesús Rodríguez Muñoz. However, as I looked over the photos I had taken of the masks in the collection of Barney Burns and Mahina Drees, I realized that I had provided an orientation to this artist, but so much that was brilliant remained to be shared. Here are a few more of his masks that are too good to let pass! 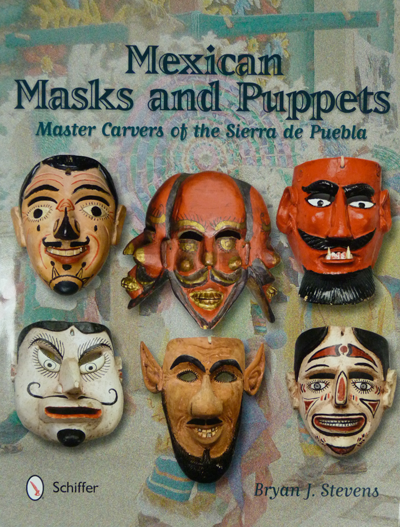 Or at least these are masks that were probably carved by Jesús, but if not by him then they were carved by other members of the Rodríguez family. It is so ironic that although Barney and Mahina Burns obtained most of their masks from the wives of these carvers, the masks were often mislabeled, frequently said to be by one brother when they appear to be by another, or attributed to someone else entirely. Tom Kolaz and I would never have had the courage to challenge such insider information, were we not so familiar with some of these carvers that we could easily see the extent of the mislabeling, and this emboldened us to rename as the evidence permitted. However, as I will continue to demonstrate over the next few weeks, the absence of reliable insider information forced us to make arbitrary assumptions, so I am offering these tentative re-attributions in a spirit of humility. The bottom line is this—I am going to show you masks that are so wonderful that the respective carvers deserve to be recognized. This first mask was labeled as the work of Jesús, and I agree, because it has the sort of forehead cross that Jesús often used on those occasions when he put a cross on one of his to be danced masks, and it has his typical conical shape. 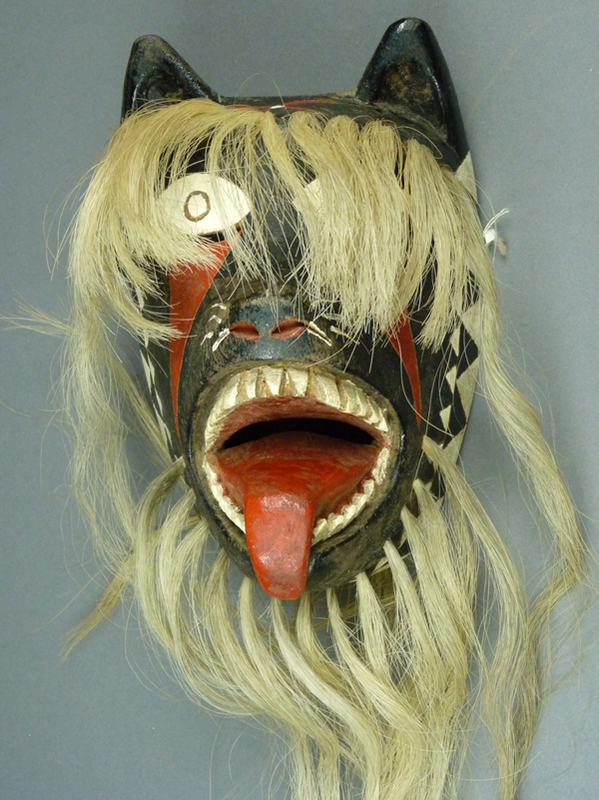 Barney and Mahina obtained this mask in 2003 after it had been used for about five years (B/M 127). 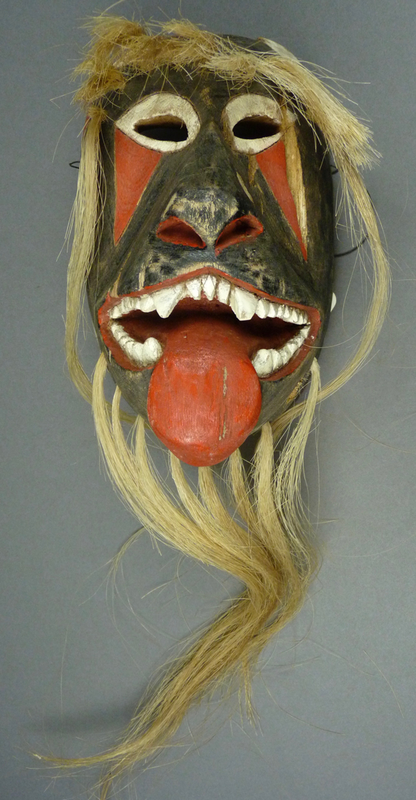 I admire the wild expression on this mask. I also like the unusual two-layered rim design—a line of small triangles within another line of much larger ones. The long curving triangles under the eyes imitate those of Preciliano Rodríguez Cupis, the father of Jesús.